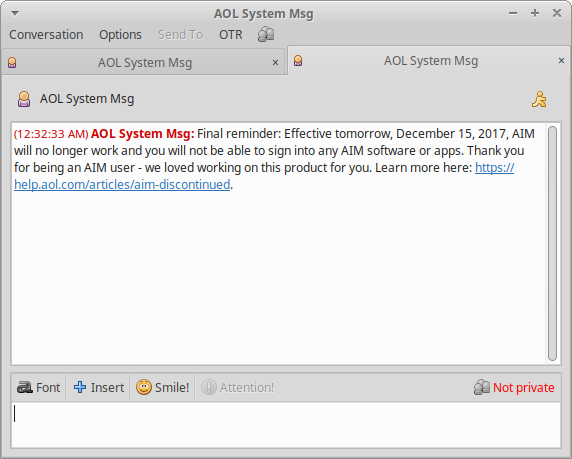 AIM (AOL Instant Messenger) will be taken offline this Friday, 15 December 2017. It has been years since I have used the service much, yet I have kept my handle in continuous service since 1998. That’s over 19 years. 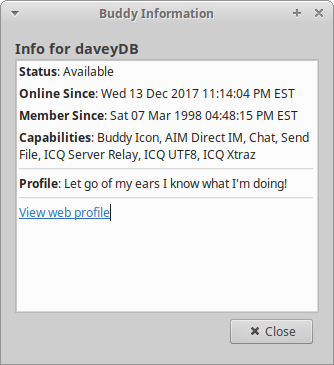 AIM was able to give me a readout of the moment Brian and I joined. 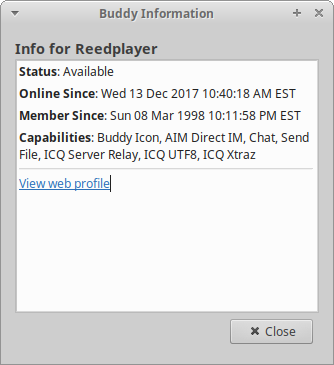 See “Member Since” in the images. These days, people use services like Signal, Telegram, WhatsApp, and others more. This entry was posted in tech and tagged aim, aol, im, instantmessenger. Bookmark the permalink. OMG, I can’t believe anything AOL still exists! My husband was just remembering all of the AOL update discs we used to get in the mail. Time really does fly re: technology. Unreal. Haven’t used it in years; I really liked it in its heyday.